I hope everyone is busy planning their Mother’s Day festivities! 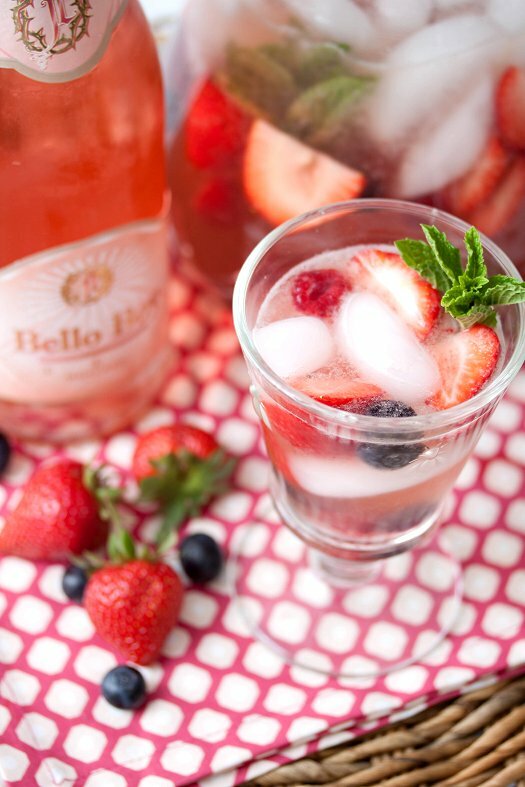 Whether your the lady being celebrated, or are lucky enough to be celebrating with your mom this year – I think there’s one thing most ladies in your life could use: a lovely cocktail that includes lots of fresh berries this Mother’s Day! One of my favorite wines to drink in the summer months are Moscatos – and I’ve been seeing more and more of them pop up on the shelves these days. They are light and fruity, and if they’re good – not to sweet. One of my favorites is Bello Boy, a Moscato infused with rose petals to give it a distinct flavor, and a gorgeous shade of rose. It’s delicious, light & complex at the same time. The man behind it is Jaime Laurita, a well-known chef who’s worked with many notable people and artists in his culinary career. Incidentally, he also happens to be of the Real Housewives of New Jersey’s Laurita crew, which I’ve made no secret is a guilty pleasure. He’s got a couple bubbly wines under his label now, as well as some other wonderful Italian products – top notch olive oils and dried pastas to name a few. The sangria comes together in a snap, and just gets better as it sits and the flavors mingle. I went with a berry theme – choosing strawberries, raspberries, and blueberries. But really, any combo of fruit would be wonderful. Looking forward to fresh peaches from the orchard down the street, they’ll be a wonderful addition. Like Hen House Linens on Facebook – leave a separate comment letting us know you did so. Like Bello Boy Moscato on Facebook – leave a separate comment letting us know you did so. Contest will end Thursday, May 16 2012 @ 11:59 PM EST. Winner will be selected using a random number generator. Congratulations to Entrant #2 – Diana. Thanks so much for entering, everyone! In a large pitcher combine berries, wine, orange liqueur, sparking water, lemon juice, and lime juice . Stir to combine. Chill for 1 hour to let flavors mingle. Serve in ice filled wine glasses with a sprig of mint for garnish. Disclaimer: I received Bello Boy Moscato and Hen House linens to review at no cost. As always, all opinions are my own. That looks so refreshing! It turns out that my vegan mom and my sister will be visiting for non-mother’s day purposes, so I’m hoping to take them to the wonderful Krishna restaurant in town! Enjoying a good bottle of wine with my daughter while my husband grills turkey burgers and sweet potato fries. Can’t wait. I know it is two days before Mother’s Day but I honestly do not know what I am going to do. The sangria looks very refreshing. For Mother’s Day my husband and youngest daughter are taking me out for brunch and for dinner we are having a dear friend and her family over for a BBQ the family lost their husband and father last October and I didn’t want her to spend the day at home. Having my family over for a BBQ! That sangria looks yummalicious. I think I will make a pitcher for Sunday’s dinner. I like Bello Boy on Facebook! I like Hen House Linens on Facebook! And you too 😉 which doesn’t count but is still fun! My husband wants to take me & our infant daughter hiking, then he’s going to make me some chicken alfredo, and a yummy chocolate cake! My mom has to work, so does my husband. It will just be baby girl and I. I’ll likely make her pancakes and head to a park if the weather is nice. We are going to Wuppertal to ride the suspended monorail trains, maybe hit either Aachen, Cologne, and Duesseldorf for grocery shopping and dinner! Cute apron. I’m going to have to check out the local stores that carry Hen House Linens – I’ve never heard of them before. My mom visits on Sunday. All other plans are up in the air. I’m *hoping* my husband plans something for my first mother’s day. I guess we’ll see! I have no plans yet. I liked Hen House Linens on Facebook. I will be spending mothers day with 3 of my kids & my husband. I will be celebrating a belated mothers day with my oldest daughter on May 28 when she arrives in town to attend her sisters graduation. I am blessed to have 4 of the most amazing budding young adults one could ever have the privilege of knowing. Since I’m the cook of the bunch….if I don’t want to starve….guess what I’ll be doing…..
Looks so yummy!! My 4 year old twins and husband are taking me out to dinner where we will meet up with my parents and my sister and her family. Happy Mothers Day!! Just “liked” Hen House Linens on FB! Just ‘liked’ Bello Boy Moscato on FB! No plans — my mom is many states away! I sent her a pretty card and will call her tomorrow. “Goin don de ocean hon” (OC, MD) taking advantage of a 3 day weekend, having our first crabs of the season, and letting our three boys play like wild men on a big empty beach. Happy Mother’s Day!! My neck of the woods – enjoy! Pink Mascato – liked FB page and now I want some wine!! My plans included sending a gift and calling my mom! I liked Bello Boy Moscato on facebook! My plans were to call my mom and give her big virtual hugs since I couldn’t be home with her! This mothers day I took a seven hour bus ride to my hometown to spend time with my mom. We were saying goodbye to the house she grew up in that we recently sold on the anniversary of my grandmother passing. Not quite a cheerful holiday- but one full of remembering amazing memories! One thing these two women passed on to me was a vintage apron collection- one that I would love to continue to build and grow for my future children! 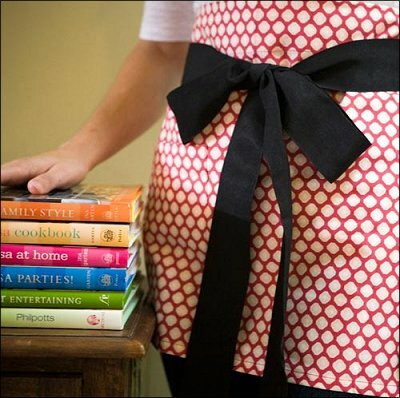 This is a beautiful apron! Well crap. I mis-read that. Mother’s Day–I cooked for a banquet. We were at my MIL’s house since it was also her 60th birthday. It was a fun weekend! I am a critical care nurse in the icu and I worked mothers day. But we made the best of it, spoiling eachother with an amazing spread of food for our break. I checked out and “liked” Hen HOuse Iinens ! They have some beautiful stuff! My husband and son spent the day with me working in our vegetable garden.